Since debuting in 2011, Brighton Digital Festival has evolved into one of the country’s most vital events for the digital industries. A month-long celebration taking place at venues across the city, it explores the seemingly endless strands of digital culture available in 2018. PLATF9RM is proud to be a sponsor (and for BDF to have their temporary headquarters on Floor 5!). We see firsthand how hard these guys work and the success of the festival is a testament to the gargantuan hours they put in. We’ve got together with them to rundown some of the BDF highlights this year. An evening of talks and networking was capped off by five incredible speakers, each recounting the story of their business adventure. Particularly memorable were Mariam Crichton’s journey to multiple startup COO and champion of equal representation, and tech superhuman Gen Ashley, who led the Women Who Code movement in London and claims to have retired (read: changed her career) seven times! It was room of bosses, to say the least. “We are not the ones who will change the world, but we ARE the change”. So began the talk from Generation Z marketing expert, Brandon Relph, during an evening that unpicked the pivotal role Gen Z will play in the workplace of the future. Brandon was joined by Lola Raye, Daisy Cresswell and Declan Cassidy and, for those of us still very much stuck in Generation Millennial (or even more backward: Generation X), it was a genuinely illuminating evening. Key takehomes were Gen Z’s preference for working alone rather than collaborating, and the need for deep analysis of technology’s impact on the lives of a generation that grew up with Google. The event was a whole day broken up in two parts: group work analysing the social issues that tech is creating, before presentations of each group’s findings. 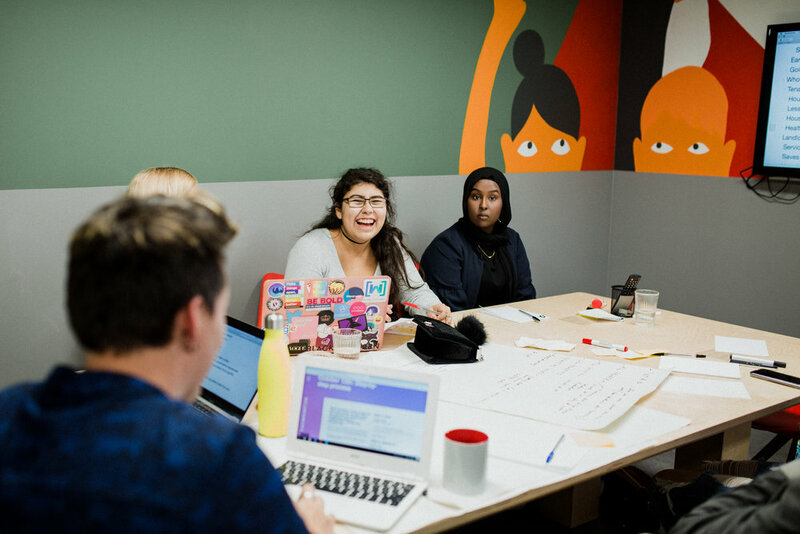 Those involved – all between 13 and 19-year-old – were hugely passionate about the issues presented, and happily deep-dived into funding and the role that local government should play in socially impactful tech business. Producer/DJ Max Cooper and design collective Architecture Social Club brought their Aether project to the Attenborough Centre. Attendees could walk underneath the twinkling light structure that altered form and shape in tandem with Cooper’s sounds that veered from ambient to twitchy techno. There wasn’t much dancing (some people were even sitting down!) but it was a perfectly immersive show for Brighton’s most distinctive venue. A hugely impressive feat of both digital and art, Thomas Buckley’s work cast a spell over The Spire (a beautiful Grade II listed chapel) with his latest immersive piece. From a raincloud above to the impressions of raindrops hitting the floor, this multi-level sensory exhibition well and truly brought the spectacle of rain inside (fortunately whilst remaining dry!). In an age where anonymity is becoming an evermore relevant issue and tensions around visibility/invisibility are rife, The Messy Edge - BDF’s in-house conference - tackled these debates from an optimistic-yet-critical stance. The event welcomed a huge spread of fiendishly clever people – like Romy Gad el Rab of Hyphen Labs and sound artist Wesley Goatley – to unpick themes of surveillance, communities, and representation. The latest developments into AR came as part of Alternate Realities: a touring exhibition from Sheffield Doc/Fest. From voice-triggered interactions with holograms in ‘Terminal 3’, to a series of 8-bit-style arcade games in ‘The Loss Levels’, the works used technologies to discuss vital issues of belonging, borders and identity. The best use of disused space is, without a doubt, to transform it into a disco. Gareth James did this with Tiny Disco, transforming unused phone boxes into pop-up discos. Once you step inside, the phone rings, you pick it up, and the disco is in full swing with music from local musicians and producers. Check out the playlist of catchy tunes here. Laurie Anderson and Hsin-Chien Huang’s Chalkroom made its UK debut in a temporary space outside The Attenborough Centre. A celebrated VR work where visitors were given 15 minute slots to soar through super-stylised virtual worlds composed of words, drawings and stories, all the while guided by Laurie Anderson’s soothing voice.